Bondmaster SMD-9000 | Welcome to A.P.E. Liquid Crystal Displays, which are bonded by Heat Seal Connector contacts (HSC) or Reflow Solder contacts, as used in Pagers, Portable Radios, PCMCIA and PCS devices. 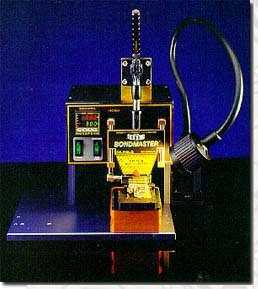 Programming and reflow functions are identical to the Sniper series of systems. A proven bonding repair and production system for Liquid Crystal Display, which are bonded by Heat Seal Connector contacts (HSC) or Reflow Solder contacts, as used in Pagers, Portable Radios, PCMCIA and PCS devices. 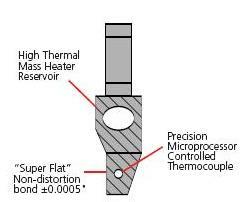 A closed-loop system continually compensates for “Set Point” of temperature drop and overshoot, which is accomplished by a centrally located, low mass (fast response) thermocouple sensor, located directly within the Hot Bar. 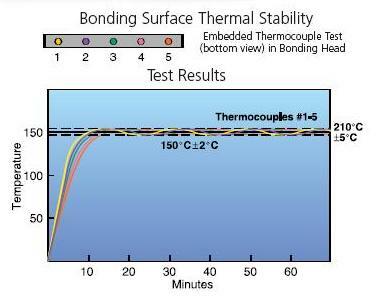 The close tolerance temperature control eliminates thermal stress, delamination and heat degradation, providing a major advantage in the reliability of the bonded components. 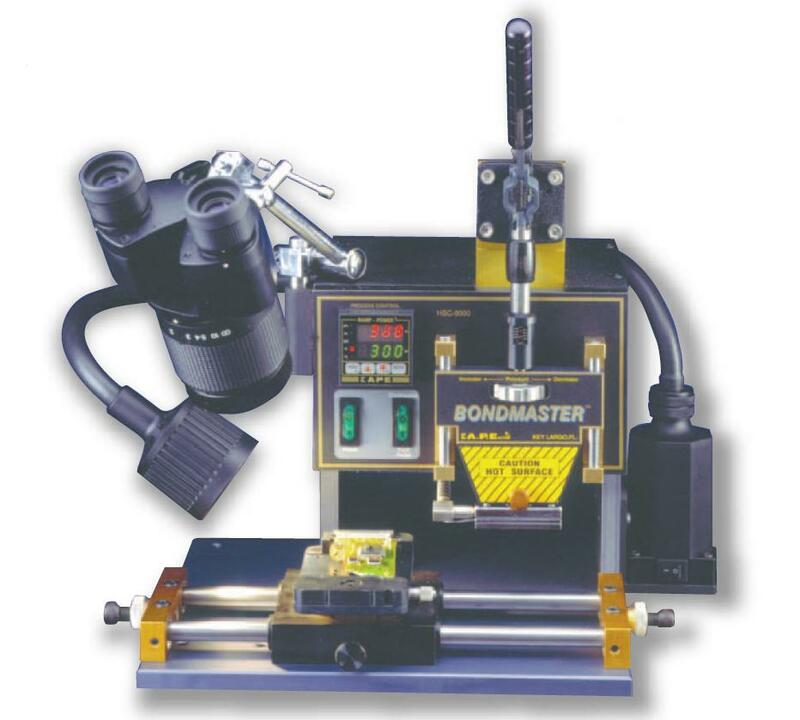 The BondMaster uses a self-aligning, free-floating Bond Head (Hot Bar Thermode), which is optomized by a Temperature Controller providing accurate and reliable temperature-time cycle control. 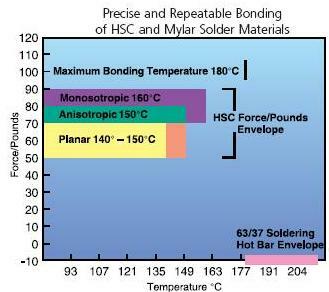 Uniform heat distribution throughout the Hot Bar is critical in ensuring a reliable bond. Time, Temperature, and Profile are controlled by the PID Controller, which stores the correct program for the bond. 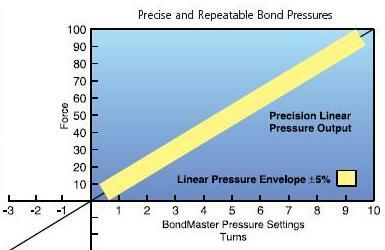 Pressure is applied by a calibrated tension, maintained by a Bearing Carriage and determined by a Thumb Wheel Adjuster. A Locking Pin protects against intervention. 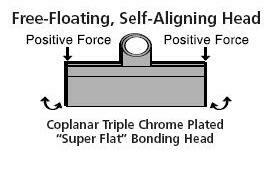 Once the subject is in place under the Bond Head and the pressure adjusted by the Thumb Wheel, the Bond Head is placed in position by a Locking Lever, which will remain until the bond time is completed. The BondMaster has been engineered to enable rapid interchange of differing product assemblies, not only for Pager products listed but also for producttion assembly of LCD and Flexible Circuits. 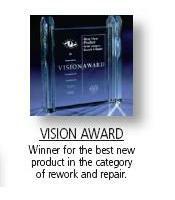 We are pleased to offer advice in developing a Fixture. However in order to keep costs to a minimum we suggest that our customers use either in-house or local facilities to fabricate fixture requirements.